The Department of Public Works and Highways (DPWH) under the administration of President Rodrigo Duterte inaugurated on Friday, March 29, a 435-linear meter concrete roadway inside Camp Aguinaldo and named the new road after the first fallen soldier in Marawi City. 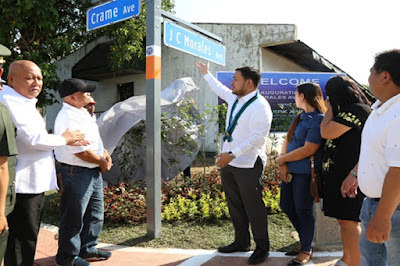 “This new road we are opening was named JC Morales Avenue to honor First Lieutenant John Carl Morales who died during a military operation against ISIS-inspired local terrorists group in Marawi City, Lanao del Sur on the 23rd of May, 2017,” said Secretary Mark Villar, who led the inauguration ceremony together with Defense Secretary Delfin Lorenzana. DPWH allocated a total of P50 million to construct JC Morales Avenue which is complete with 36 inches in diameter reinforced concrete pipes manholes and 1.2-meter sidewalk both sides. First Lieutenant Morales who was the Company Commander of the 49th Infantry (Good Samaritan) Battalion of the Philippine Army during the siege led his men in a 6-hour firefight that led to eight (8) enemy casualties and recovery of weapons and other rebel assets. “We hope that as we improve traffic within Camp Aguinaldo with this new road, we will likewise spread the heroism of First Lieutenant Morales and the rest of the fallen soldiers who sacrificed their lives fighting for the people of Marawi City,” said Secretary Villar. After the inauguration of JC Morales Avenue, Secretary Villar and Secretary Lorenzana also led the groundbreaking ceremony for the construction of The General Headquarters and Headquarters Service Command Firing Range which will be implemented by the DPWH Quezon City Second District Engineering Office. The road project also covers improvement and upgrading of existing roads: the 437.25-linear meter Crame Avenue Extension with newly constructed and opened “Gate 5” that will serve as entry and exit portal from White Plains Avenue; and 415-linear meter Capinpin Avenue Extension. A total of P30 million was allocated to construct the project which is expected to be completed by December 2019.